Historically, Washington State has been slower to fill its 30 allocated J-1 waiver physician spots than many other states. As of this writing, the Washington State Health Department has published that it has received 17 applications for J waivers so far, with 9 applications fully approved. The State has already received 10 specialist petitions, and 5 of those are fully approved. We are presently in a timeframe where primary care applications for health professional shortage areas are the only ones which have a guaranteed spot. On January 15th, the State will open up the application window for primary care FLEX spots—positions which are not in a health professional shortage area but which serve an underserved population. On April 1st, the agency will approve additional Specialist applications. As the agency has not approved all 10 Specialist petitions received yet, it may still be worthwhile to inquire on handling of Specialist applications in the interim, in case one or more of those received so far is non-qualifying. J-1 waiver applications require that the sponsor show that at least 15% of the total patient visits are for Medicaid or other low income patients. Employers have to be able to document at least six months of unsuccessful recruitment in the last year for the position. Employers also must have a sliding fee scale, which is posted for patients, and there are specific employer-physician contract requirements. Facilities and physicians interested in seeking a Conrad J-1 wavier based on the Washington State program should not tarry. It is hard to predict how fast the remaining spots will go. Last year, a few spots remained until the very end of the year. If recollection serves me, the year before, the agency received 34 applications for 30 slots, well in advance of the end of the year. Oregon last year filled up long before the end of the year. We have a great deal of experience helping facilities and physicians navigate the Conrad waiver process, all the way to permanent residence. It is meaningful and rewarding work, which we care greatly about. Feel free to contact us if you’d like to schedule a consultation. I visited Washington D.C. last week, to take part in the American Immigration Lawyer Association’s National Day of Advocacy. This is an annual event, where my lawyer organization encourages members to meet with Senators and Representatives to discuss immigration issues. And there are issues. Many issues. Immigration continues to be headline news. Real policy and law-making requires consideration of details and implications. As far as I can tell, Congress is getting nowhere. This is pretty much acknowledged by staffers. By now, they know the sad stories, such as the Dreamers and the emphasis on deportation. They are aware of the flawed system with H-1Bs and other worker authorizations. They know about the backlogs. Stalemate and non-cooperation leave these challenges for another day, again and again. 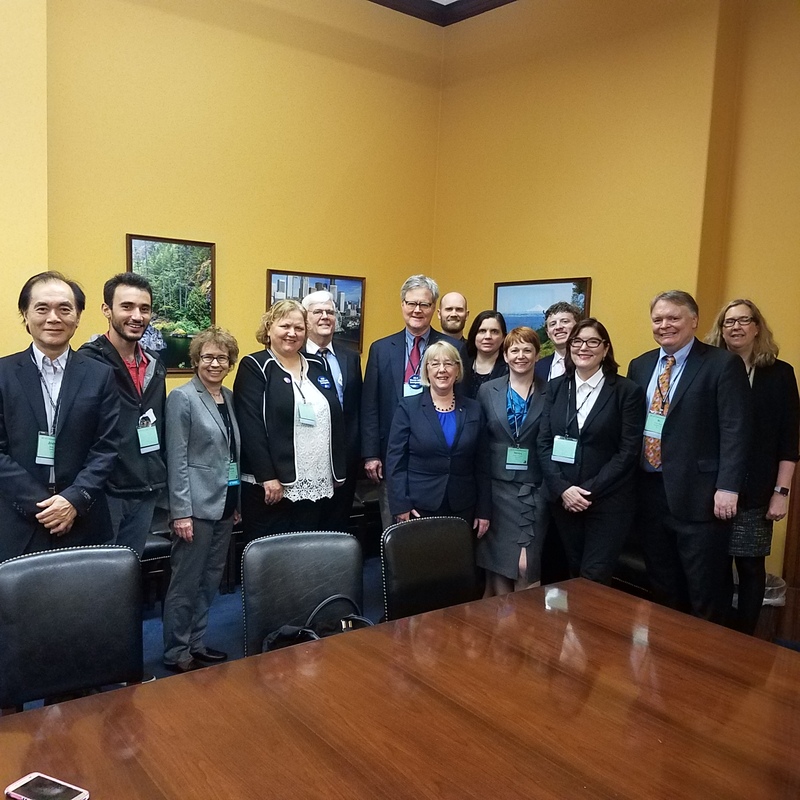 I had the opportunity to meet with staffers from the offices of Senator Murray, Representative Larsen, Representative Del Bene, and Representative McMorris Rodgers. 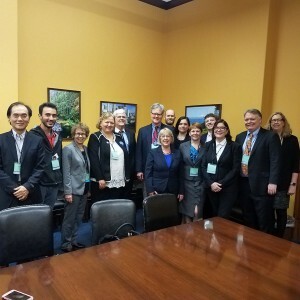 Senator Murray and Representative Larsen were able to meet briefly as well. I and my colleagues greatly appreciated the meetings, and we had some good discussions. Our office stays in close contact with our elected officials. Last week, my comments focused on things I’m seeing in practice lately, which might not be getting the attention they deserve. CBP officers are taking statements from applicants for admission on past marijuana use, and then barring them for life after people answer truthfully that they did, in fact, inhale. They are also doing extensive searches of people’s phones and computers, without reasonable suspicion. USCIS is issuing requests for evidence on cases without justification, at ever increasing rates. Physicians are getting caught up in the administrative dysfunction, with the suspension of premium processing and rotations turning over mid-summer. Also, the Conrad program for physicians who serve underserved communities is caught in the undertow of the more controversial EB-5 renewal. And of course, our national security has been harmed by some of the thoughtless policies that have been proposed. I also see that clients are just plain concerned. It is a time for advocacy. I believe that America is still a nation of immigrants. America has gone through phases before. I also believe our Bill of Rights protects people from injustice, including noncitizens and immigrants. So, it’s a good idea to keep calling on our elected officials, and be engaged. That’s what we’re doing. Tags: advocacy, Cascadia, Conrad, immigration, physician, Scott Railton, Washington D.C. The U.S. Department of State released its figures recently concerning the issuance of J-1 waiver recommendations. The Department of State has authority to issue waivers of the two year foreign residency requirement which often accompanies the issuance of a J-1. The standards for obtaining a J-1 waiver are typically rigorous and fraught with bureaucracy. However, once a recommendation to approve a waiver has been made to the Department of State, the approval of the waiver seems to be largely a formality. For example, for State Department of Health waivers, in 2013 there were 1033 favorable recommendations and 0 unfavorable recommendations. These waivers include the Conrad 30 waivers for physicians. For these waivers, the State Department of Health must issue a recommendation, and each State has different standards. For example, Washington State requires at least six months of specific forms of recruitment for the position, amongst many other requirements. As such, to be successful, a fair amount of advance Human Resource planning is required. Similarly, the Department of State reports that in the Fiscal Year 2013 it issued 111 favorable findings for Interested Government Agency-Physician waivers, and none unfavorable. Exceptional hardship waivers were approved more often than not, with 228 recommendations. However, in this case, there were 50 cases where there was an unfavorable finding. Similarly, most No Objection statements were approved (4269), but a slight number of cases (119) were not. As far as the percentages go, a waiver based on Persecution had the least likely chance, with 31 approved and 6 cases not approved. When it comes to obtaining a J-1 waiver, a certain amount of due diligence and planning is necessary. Identifying the appropriate waiver to pursue in the first instance is paramount. This decision will be made based on any number of program and person specific factors.